TYPO3 CMS provides its own HTML parsing class: \TYPO3\CMS\Core\Html\HtmlParser. This chapter shows some example uses. As you can see the HTML source has been divided so the "div" section and the "table" section are found in key 1 and 3. Odd key always correspond to the extracted content and even keys to the content outside of the extracted parts. Notice that the table inside of the "div" section was not "found". When you split content like this you get only elements on the same block-level in the source. You have to traverse the content recursively to find all tables - or just split on <table> only (which will not give you tables nested inside of tables though). 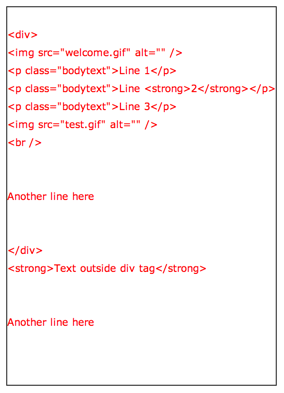 Note also how the HTML parser does not care for case (upper or lower, all tags were found). Again, all the odd keys in the array contain the tags that were found. Note how the parser handled transparently simple tags or self-closing tags. The HTML parsing class also provides a tool for manipulating HTML with the HTMLcleaner() method. The cleanup configuration is quite extensive. Please refer to the phpDoc comments of the HTMLcleaner() method for more details. We first define our cleanup/transformation configuration. We define that only five tags should be kept ("b", "img", "div", "br" and "p"). All others are removed (HTMLcleaner() can be configured to keep all possible tags). Additionally we indicate that "b" tags should be changed to "strong" and that correct nesting is required (otherwise the tag is removed). Also no attributed are allowed on "b" tags. For "p" tags we indicate that the "attribute" should be added with value "bodytext". Lastly - in the call to HTMLcleaner() itself, we request "xhtml" cleanup. There's much more that can be achieved with \TYPO3\CMS\Core\Html\HtmlParser in particular more advanced processing using callback methods that can perform additional work on each parsed element, including calling the HTML parser recursively. This is too extensive to cover here.